Peter W. Callander, M.D. is a board certified and fellowship trained orthopaedic surgeon who specializes in state-of-the-art total hip and total knee replacement surgery. He has performed over 5,000 surgeries since he began his career in orthopaedic surgery. His area of expertise includes the minimally invasive direct anterior approach to hip replacements, hip resurfacing, partial and total knee replacement, and revision of joint replacements. He underwent his fellowship training at the Hospital for Special Surgery – Cornell University which is rated number one in Orthopaedics by US News and World Reports. 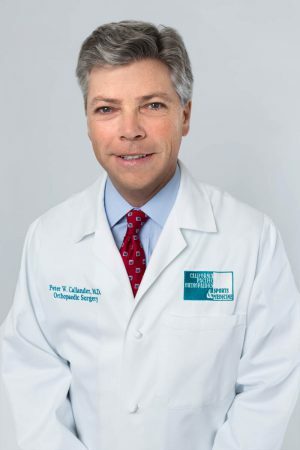 He is also noted as a hip-resurfacing specialist and was one of the first U.S. physicians exclusively selected to perform the Birmingham Hip Resurfacing technique after the FDA approval in 2006. Dr. Callander has been published in numerous medical publications and has made presentations on his area of specialty both regionally and nationally at the American Academy of Orthopedic Surgeons. Earlier in his career, Dr. Callander provided humanitarian medical and surgical work for Operation Rainbow in Guatemala and with International Relief in Addis Ababa, Ethiopia. Currently, he serves as an orthopedic consultant for the San Francisco Ballet.